Have you ever found your Web browser loaded with mysterious toolbars out of the blue, and wondered where they came from? I see this all the time. One day someone's browser is humming along as always, and the next it's saddled with a bunch of weird toolbars they didn't ask for and don't want. Spyware is one possible culprit. If you suddenly encounter a toolbar called Super Internet Search or something equally fishy, it probably got there by way of a drive-by download (spyware that broke in when you visited a tainted site) or some other kind of infection. Scan the PC promptly with a good antimalware tool--and whatever you do, don't use any of the toolbar's buttons or its search box. Another possible culprit: you. Many freeware, shareware, and even commercial programs try to slip in a browser toolbar during installation; and if you're not paying attention, you might click right past the setup screen that lets you opt out. 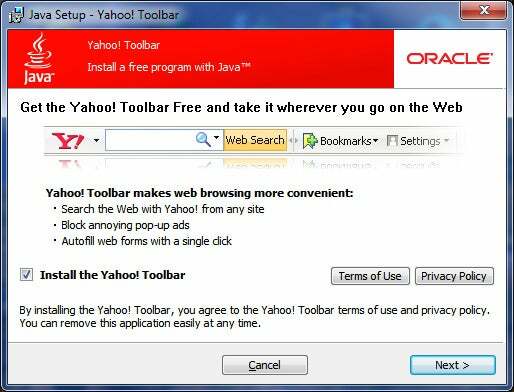 For example, when you install a Java update, you'll end up with the Yahoo Toolbar unless you uncheck a box along the way. That particular toolbar isn't spyware, and you can easily uninstall it--but it's still an unwanted addition to your browser. Bad developers, bad!